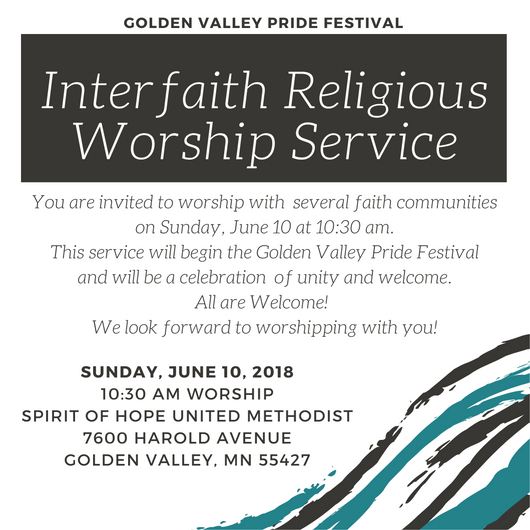 The 2018 Golden Valley Pride Festival was on Sunday, June 10 from 12-6 pm. Stay tuned for details about 2019 Pride! Delicious food from local food trucks & vendors, including New Bohemia (3rd year in a row! ), Milton’s, Panini Pinups, Outlaw Grill, MN Nice Cream, Caribou Coffee, WildEarth WoodFired Pizza, Gastrotruck, Potter’s Pasties & Pies, and Heavy Metal Grill. The Golden Valley Pride Festival has activities for the whole family, including two bouncy houses, community booths, giant jenga, corn hole / bean bag toss, and Brookview Playground! For the second year in a row, Utepils Brewing Co. will be serving delicious local brews. This year, they’ll be joined by Cedar Lake Wine Company, which will be selling a special pride rosé.